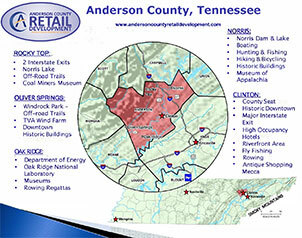 Welcome to Anderson County Retail/Commercial Development. We are here to assist you with selecting a site for a new business, connect you with resources to expand a current business, and promote retail opportunities for developers and businesses. With our close proximity to the Knoxville Metropolitan area, Anderson County offers many competitive advantages including: stable business environment, strategic location with exits along I-75 and easy access to I-40, low taxes, available buildings and sites, and a strong workforce. Along with our wonderful quality of life, including rivers, mountains, and lakes, Anderson County offers a business friendly environment to help you be successful!